Catskill, NY (April 1, 2019) – State police were promptly summoned to the scene of a serious personal injury accident that tragically claimed the life of one person after two tractor-trailers collided along the Thruway on Sunday, March 31st. The deadly crash was reported to have happened in the early morning hours at 5:38 a.m. in the northbound lanes of Interstate 87. According to authorities, the impact of the collision caused both tractor-trailers to catch fire and prompted responses from police, firefighters, and emergency medical services. Responders at the crash site were able to verify that one of the drivers involved in the accident was sadly pronounced deceased at the scene. There has been no information concerning the condition of the other driver involved. All northbound lanes of the Interstate were blocked for an extensive period of time as responders attended to the victims and worked to clear the scene. No further information has been released as the investigation into this incident is currently ongoing. Our deepest condolences are wholeheartedly extended to the loved ones of the deceased victim during this tragic and devastating time. 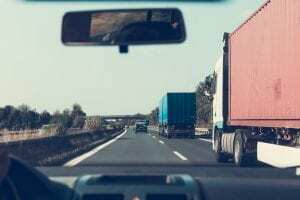 Unfortunately, truck accidents in New York are frequently fatal or seriously injurious, especially when more than one tractor-trailer is involved. While it can be terribly challenging, it is terribly important for the bereaved family to know that they may have substantial rights at this time. At Hach & Rose, we understand that there is nothing as overwhelming as the sudden loss of a family member, and as members of the community, our accident attorneys are here for you 24/7 to answer any questions you may have. If you have lost a loved one in a New York truck accident due to circumstances beyond the victims’ control, please don’t hesitate to call 212-779-0057 today.